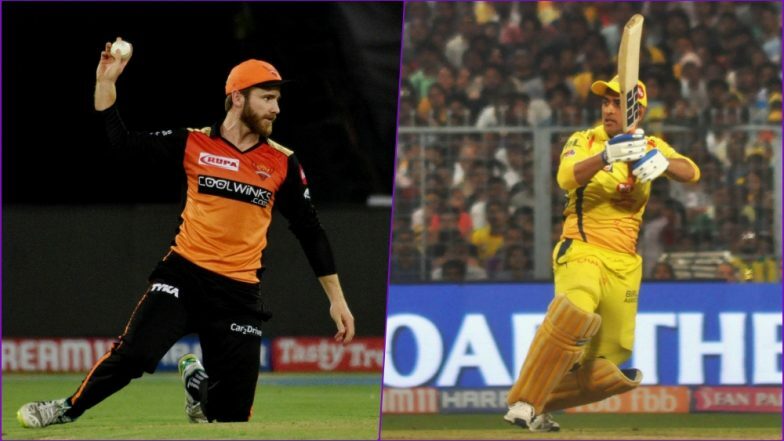 SRH vs CSK Head-to-Head Record: Ahead of IPL 2019 Clash, Here Are Match Results of Last 5 Sunrisers Hyderabad vs Chennai Super Kings Encounters! Two quality sides with contrasting fortunes in the Indian Premier League (IPL) 2019 so far come face to face in Hyderabad. While Chennai Super Kings (CSK) have been decimating opponents with ease this season, Sunrisers Hyderabad (SRH) find themselves staring a three successive defeats and in desperate need of points. Table toppers Chennai will make sure of a place in the next round with a win over Sunrisers Hyderabad and this they can achieve in the ninth game of the season itself. Speaking of Chennai Super Kings vs Sunrisers Hyderabad head-to-head record, the two teams have met 11 times with Chennai winning 9 of these contests while two went in favour of Hyderabad. A look back at how their last five encounters panned out. SRH vs CSK, IPL 2019 Match 33 Preview: Sunrisers Hyderabad Aim to End Losing Streak Against Chennai Super Kings. Shane Watson single-handedly won Chennai the title as his massive 117 runs off 57 balls helped CSK chase down 179 needed to lift the 2018 IPL Trophy. Watson started off slowly, but once he found his feet, there was no looking back as he destroyed the Hyderabad attack with ease. Earlier Kane Williamson had slammed 47 to help take his team to 178/6 in twenty overs. IPL 2019 Today's Cricket Match Schedule, Start Time, Points Table, Live Streaming, Live Score of April 17 T20 Game and Highlights of Previous Match! A brilliant game of cricket which Chennai Super Kings won thanks to South African skipper Faf Du Plessis magical innings of 67. Chasing 140 for a win, Chennai found themselves struggling at 92/7, but Faf Du Plessis stuck a useful partnership with Shardul Thakur lower down the order to script a memorable win. Rashid Khan gave away 11 runs in his four overs picking up a brace for Hyderabad, but it was all futile in the end. Another day and another Chennai win chasing against Hyderabad as Ambati Rayudu struck a hundred in response to Sunrisers Hyderabad’s 179/4. Openers Ambati Rayudu and Shane Watson put up a 134-run stand at the top which completely eased off any pressure on the Men in Yellow. None of the SRH bowlers could come to the grip against a quality batting performance by their illustrious opponents gifting away the game. Kane Williamson’s 84 and Yusuf Pathan’s 45 went in vain as they fell 4 run short of Chennai Super Kings’ 182/3. Deepak Chahar picked up three wickets, and Dwayne Bravo showed his experience in the death helping Chennai pick up two points. A no-ball missed by the on-field umpires became the talking point as Hyderabad felt the result could have been different if the umpiring was better. David Warner hit a 28 ball 61 in Sunrisers Hyderabad’s massive 192/7 batting first which was a good first innings total at Uppal. Chennai’s response lacked the punch as, despite a few batsmen getting good starts, none went on to make a big score which was needed for a victory. Bhuvneshwar Kumar and Moises Henriques picked up two wickets each helping their team restrict CSK to 170/6. Hyderabad lost four times to Chennai last season, and revenge will undoubtedly be on the minds of the Sunrisers’ camp when they meet in their own backyard.